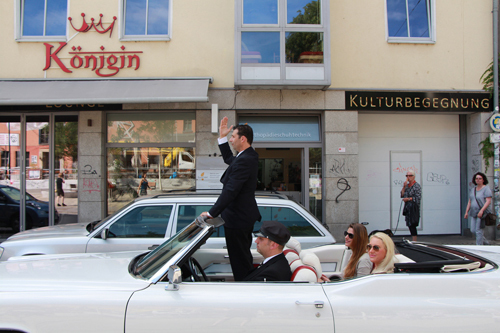 In the video homecoming artist the artist Shahar Marcus driving with two young models at the back seat at the heart of the city of Dresden in Germany. During the ride the people of the town are being asked do they know or heard about the artist. None of the people know and most of them don’t care about art at all. Never the less while riding slowly around the city Marcus is waving to the people and the people are waving him back as if he is a known celebrity or a local Politian who is doing his campaign election right now. The drive implicates the gap between the art scene and the common citizen in small towns .